Participants on the 'Lessons from Srebrenica' programme from the South West region of England share their experiences of being in Bosnia and what they've learnt to take back to the UK. 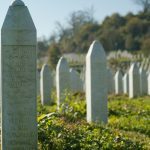 In November 2016, Remembering Srebrenica took the first ever delegation from the South West Region of England on the ‘Lessons from Srebrenica’ programme. This powerful experience has created over 900 Community Champions who return to the UK determined to make a difference and stand up to hatred and intolerance. In this video, three of the participants talk about what it has meant to them and what they intend to do with the experience.